Gathering of Global Social Movements Taking Place in Global North for First Time. So goes the slogan of this year’s World Social Forum taking place in Montreal from Aug. 9 to Aug. 14. 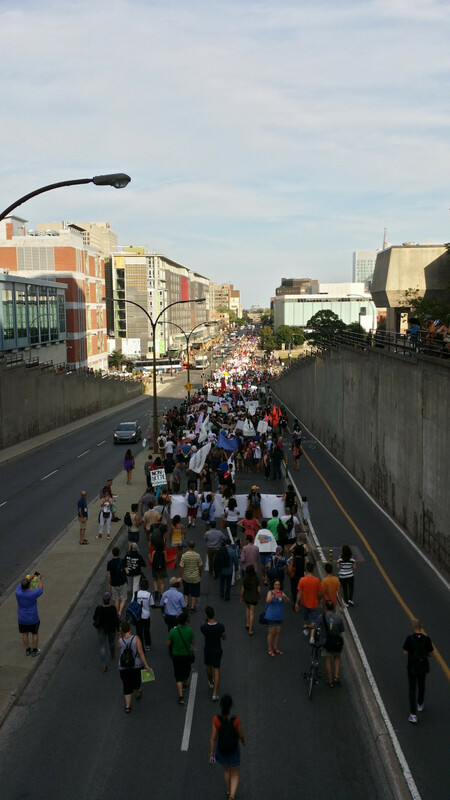 To commemorate the opening of the forum, an estimated 10,000 people took to the streets of downtown Montreal on Tuesday afternoon. 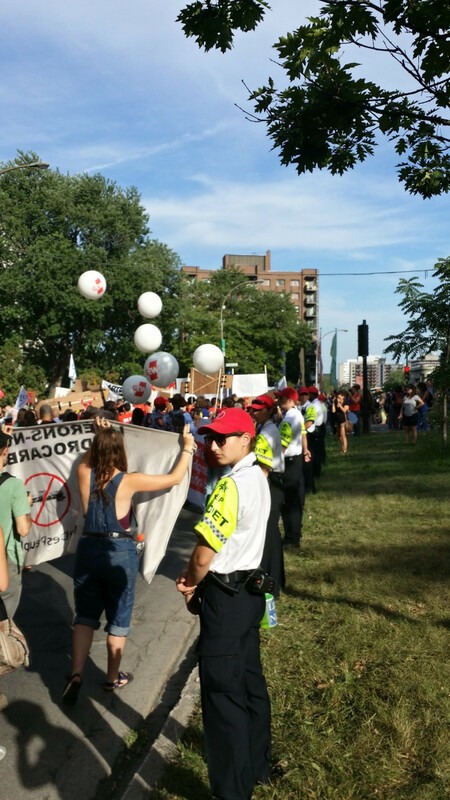 The demonstration began in Parc Lafontaine, and finished in Place des Festivals, taking Maisonneuve Blvd. for most of the way. The World Social Forum is a yearly event that began in 2001 in Porto Alegre, Brazil. It was first held in direct opposition to the World Economic Forum—an annual invitation-only event in Davos, Switzerland, where corporate and state representatives collaborate on planning the world economy. 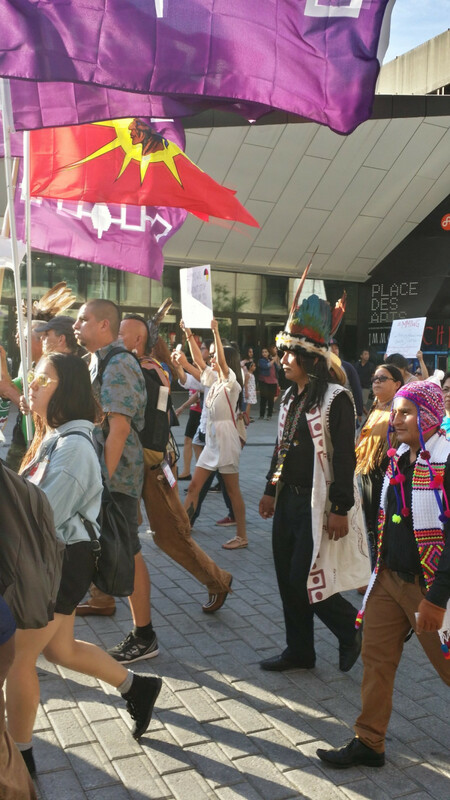 Tuesday’s demonstration was led by indigenous people waving the bright purple flag of the Six Nations Confederacy, whose Kanien’kehá:ka people inhabited the island of Montreal before the arrival of European colonizers. Following the indigenous people marched a rich tapestry of many different groups, hailing from all over the world. Many large Non-Governmental Organizations—such as Oxfam, for example—were present, as were many of Quebec’s labor unions and union federations. Local grassroots environmental organizations were also highly visible, as were various international solidarity efforts, notably Palestinian and Kurdish groups. Some leftist political parties were also present. When the demonstration ended in Place des festivals, an opening ceremony was conducted by indigenous participants, and was followed by concerts which ran late into the night. Immigration Canada has refused over 200 travel visas for WSF delegates from the Global South—a total of over 70 per cent of the official organizational delegates from Latin America, Africa, and Asia. Many of the refusals were justified, according to organizers of the Montreal Indymedia Convergence, on seemingly arbitrary grounds such as the failure to provide documentation which had not been requested by the Canadian government. One delegate who was refused entry to Canada was Aminata Traoré, a candidate to succeed Ban Ki-Moon as the Secretary General of the United Nations. She has traveled to Canada many times in the past, she said in an interview with CBC. The mass-refusal of delegates’ visas was foreseen by some in criticisms of the decision to host this year’s WSF in the Global North. Participants in the demonstration were seen carrying human-shaped cardboard cutouts with the names of individuals whose visas were refused. The WSF was conceived as a space where a wide array of diverse social movements could meet each other and build bonds of solidarity, and develop common ideals and strategy for social change. They’re generally grouped together under the banner of the alter-globalization movement due to their common opposition to the neoliberal policies exemplified by the World Economic Forum. In years since, the WSF has been held in India, Mali, Venezuela, Pakistan, Kenya, Senegal, and Tunisia. This year’s forum, in Montreal, marks the first time that the event has ever been held in a developed country in the Global North. The WSF is composed mainly of “self-managed” workshops—activities proposed, planned and carried out by organizations independent of the WSF. In total, over 1,300 such activities will take place before the end of the forum. The workshops cover issues ranging from climate justice to indigenous rights to migrant solidarity, and beyond. Workshops will be given in French, English, and Spanish. Along with the workshops, the WSF will also host “Assemblies of Convergence,” where different organizations within a given sector—such as environmental groups, or labour organizations, for example—join together and attempt to create common strategies. Twenty-six such assemblies will take place in total. The Link will provide further coverage of the WSF as the events progress.